Ibiza’s long marvelous summers with plenty of sunshine are what made it famous (as well as its legendary parties). The sun is shining everyday from May to September, peaking at an average of 13 sunlight hours per day in July. The sunshine levels in autumn are still great at an average of 9 hours. The darkest months of January and February are seeing an average of 7 sunny hours per day. In spring, a healthy amount of sunshine to be enjoyed getting up to an average of 9 hours in March and 10 in April. The climate in Ibiza is Mediterranean, enjoying long hot and dry summers and mild winters. The island is famous for its glorious beach weather with plentiful sunshine. During the early spring, the temperatures are slightly chilly. Daytime temperatures range from an average of 17°C to 22°C. The summer season starts from June and lasts until September. August is the hottest month with an average temperature of 29°C. July has the lowest average rainfall – just 10mm. In autumn, the overall weather remains warm and pleasant. Daytime temperatures rise to an average of 24°C in October and lower to 19°C in November. However, rainfall increases during this period and averages between 55mm and 77mm with the wettest month being October. In summer, a cooling sea breeze brings a pleasant relief from the hottest temperatures. Dust storms occur in the late winter/early spring time (usually between January and March). During this period, heavy rain and high winds can hit the island for 2-3 days. These hot winds are blowing across from the Sahara, due to the island’s close proximity to North Africa. The sea temperature is warm in summer, rising from around 21°C in June. The best month to swim in the sea is in August when the average sea temperature is peaking at 26°C. Generally, swimming in the sea is comfortable from May right through until October and often even longer. Sea temperatures during the spring tend to average at 18°C. 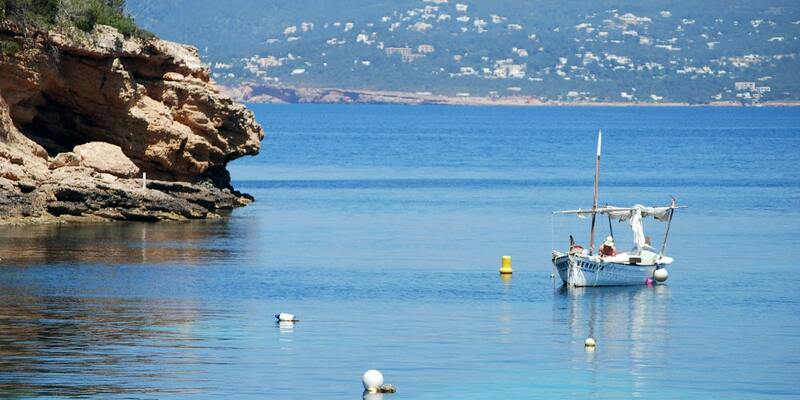 Situated on the south-west of the island, Sant Josep de sa Talaia (or San José) is the largest municipality on Ibiza. 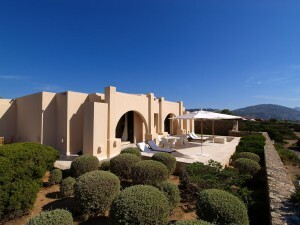 Yet, the location offers a unique laid-back atmosphere, ideal to enjoy a relaxing and quiet holiday or a break to recover from various Ibiza attractions. The properties in the area include restored Ibicenco farmhouses set among citrus orchards, almond groves, and pine-clothed hills, making it a truly tranquil base for your Ibiza second-home. 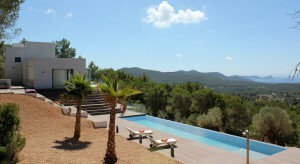 Sant Josep de sa Talaia property market offers luxury villas and country houses. An average price for a house in the area hovers Average price per sqm. in Sant Josep de sa Talaia (Municipality) €6,529 0% properties#: 580 last change on: 23 Apr 2019 €6,529 per sq. meter, while for apartments it is Average price per sqm. in Sant Josep de sa Talaia (Municipality) €5,369 0% properties#: 225 last change on: 23 Apr 2019 €5,369 . There is a premium value on the top of the selling price for a house with a view of the Mediterranean Sea. Investment opportunities have a current average value of Average price per sqm. in Sant Josep de sa Talaia (Municipality) €3,678 0% properties#: 35 last change on: 23 Apr 2019 €3,678 per square meter. The most renowned agencies on Sant Josep de sa Talaia property market are Luxury Villas Ibiza with more than 130 active listings, followed by Ibiza Properties for Sale, Everything Ibiza and BBS Consulting exceeding 50 listings. Why Sant Josep de sa Talaia property? The municipality stretches considerably in the south to the Eivissa, Platja d’en Bossa, and northeast it borders by the municipality of Sant Antoni. The coastline of the region is the most extended. It is the one that offers the greatest number of beaches throughout its 80 km of coastline. Namely, it hosts popular quality beach resorts and beautiful coves (cala in Spanish). These include Cala D’Hort, with views to the emblematic isle of Es Vedrá, Cala Vadella, perfect for families, Cala Molí, Cala Conta along with its new ecological urbanization and Cala Bassa. All of them boast amazing sunsets. Also, here you find isolated fishermen bays preserving the traditional ambience, such as Porroig, es Xarco, sa Caleta, Cala Llentrisca, and Cala Corral. The region offers quite interesting hiking routes to explore and enjoy the beauty of the unspoilt nature. Here you will see defensive towers in hidden enclosures, such as the tower of d’en Rovira, located in Platges de Comte, the Pirate Tower in Cala d’Hort, or the Carregador tower, near Ses Salines. The municipality’s centre, the small town of the same name, is situated beneath the highest mountain on the island. The Sa Talaia mount (475 meters) boasts excellent scenery and the best panoramic views. San José is known as the island’s richest town. It is also the one that strongly preserves its authenticity. The attractive whitewashed church situated on the town’s main square with the large facade is considered as the most interesting on Ibiza worth seeing. This charming village offers a myriad of services, yet, it is just minutes away from Eivissa, where you will find a vibrant cosmopolitan city with plenty to offer. Apart from Sant Josep, the municipality includes the villages of Sant Jordi de Ses Salines, Sant Agustí, and Es Cubells. All of them are quiet picturesque areas with charming white walled churches. Sant Jordi village is the nearest to the airport (just 3 km). Its most notable sites are the two churches: a fortified church enclosed by palm trees and flowers and another one located at the entry to the Ses Salines Natural Park. Attractive villages of Sant Agusti and Es Cubells provide amazing views of the sea. Sant Agusti is also well-known for its saint patron festivities with open air concerts, which are held at the end of August. 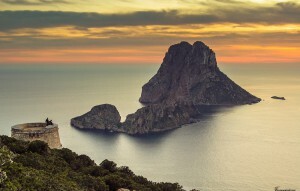 Here you will also see the Es Vedra islet, rising from the sea like a pyramid. With its laid back, traditional Ibiza vibe, all needs are catered for in this year-round vibrant community of San Jose, which is so favoured by both holiday-makers and second-home buyers.